Draco watched happily while the family that had lost each other for so long, finally hugged each other. He wished his parents was there too now, oh well, he would hug them when he visit them later.
" Mom...? I missed you so much. Both of you" Hermione cried in their shoulders. " We&apos;ve missed you more, honey " Her mom cried. " Your boyfriend succeded to find us " Her dad said. " 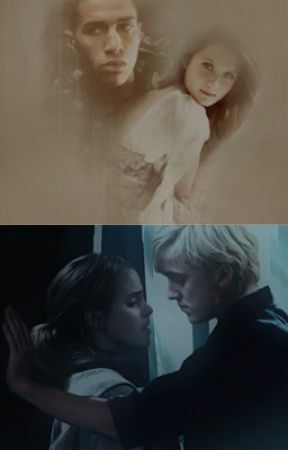 He actually saved us one time"
Hermione turned around and looked at Draco. " You&apos;ve saved them...? Well, Blaise told me that you killed someone but...."
" The man I killed was hired to kill your parents. I tracked him down, and saw the chance to stop him, so I did" Hermione was shocked that he actually had killed someone, but he did it for her and her parents sake.
" Oh Draco..." She hugged him and gave him a peck on the lips. " What would be without you? So That&apos;s why you were gone for so long? And Blaise knew everything?" " Yes, and yes Blaise knew" " I&apos;m gonna kill him when I meet him" Hermione chuckled. " He knew where I was so he knew where he would go if you were in trouble and needed me"
" Okay, I won&apos;t kill him" Hermione mumbled. " Do you want some cake?" Draco said and looked over at her parents who gladly nodded. After a while they all sat outside in the garden and ate. Draco and Hermione talked about how they met and about everything they&apos;ve been through. After they finished, Draco asked Hermione&apos;s dad if he could talk to him. He replied with a nod and they walked away. Draco suddenly seemed nervous. " Sir, there&apos;s something important I need to ask you about " Her father nodded. " Tell me, I&apos;ll listen"
" I really love your daughter, and she really is the one. She is the one I want"
" I&apos;m glad you say so, I know how you feel " Draco breathed out, relived. " Well, this is very important. And I want to talk to you about if first"
" Can I ask Hermione for her hand in marrige?" Her father&apos;s eyes got wide open and he looked at him with a confused and surprised look. " Please?" Draco begged. After a short silence he finally replied.